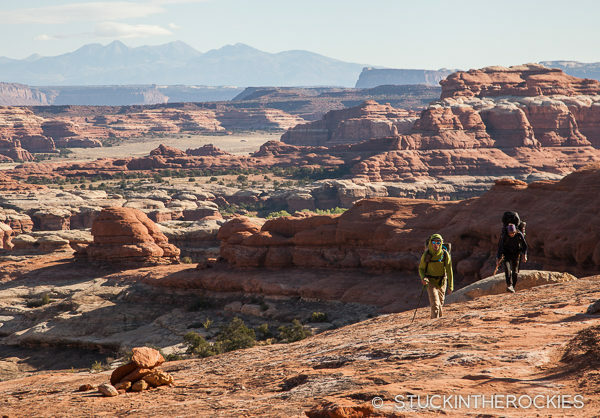 Taking it all in on the fourth day of our backpack through Salt Creek, in the Needles District of Canyonlands National Park. 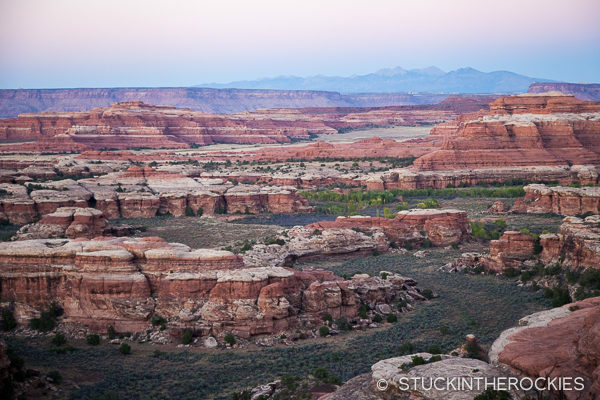 At the far southern end of the Needles District of Canyonlands National Park is a valley called Salt Creek. 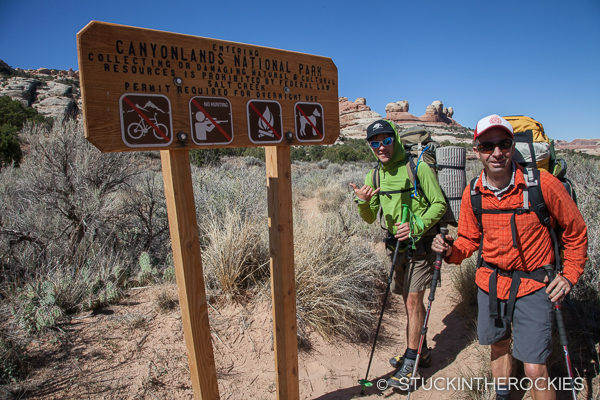 This desert canyon is an interesting multi-day backpack, a point-to-point route covering about 25-30 miles, depending on how much off-route exploring you do. 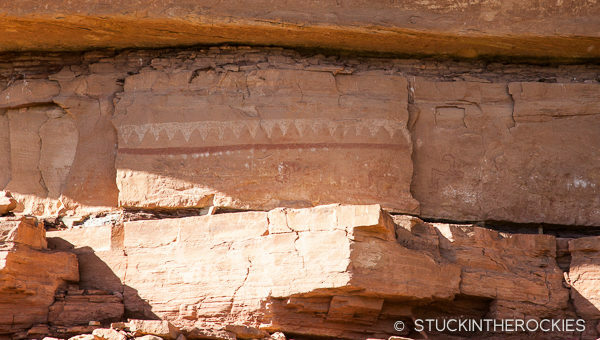 While Salt Creek offers typical desert scenery one would expect in Canyonlands, it is really its Ancestral Puebloan history that makes it interesting. 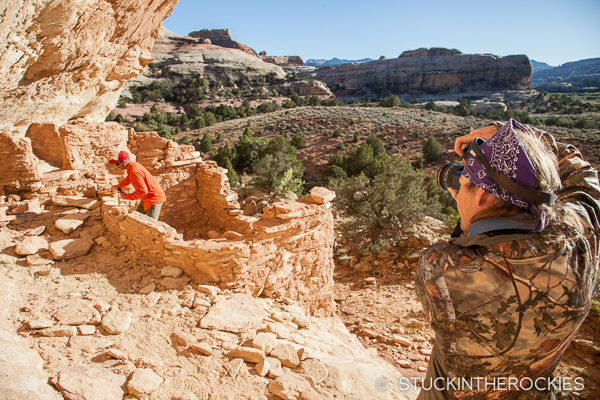 The Salt Creek region is full of ancient ruins and petroglyphs unlike other areas of this national park. Entering the park after descending from Cathedral Butte. 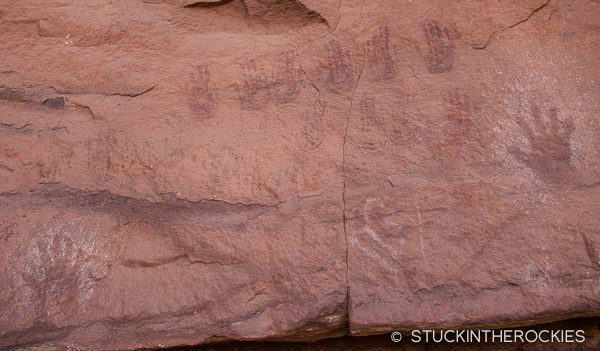 Shortly after crossing the national park boundary we came across these petroglyphs. A trip here requires some advanced planning. 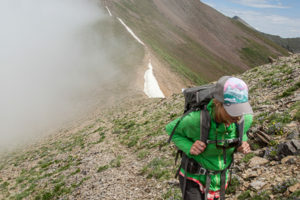 A backcountry permit is required to camp within most of the Salt Creek, and campsites need to be reserved in advance. There are only four campsites in the permitted area, and being so limited they can be hard to get. But the silver lining of limited permits is that you won’t be in there with many other people. The Kirk Cabin, named for a homesteader who built it back around 1890. An area of ruins by our camp the first night. 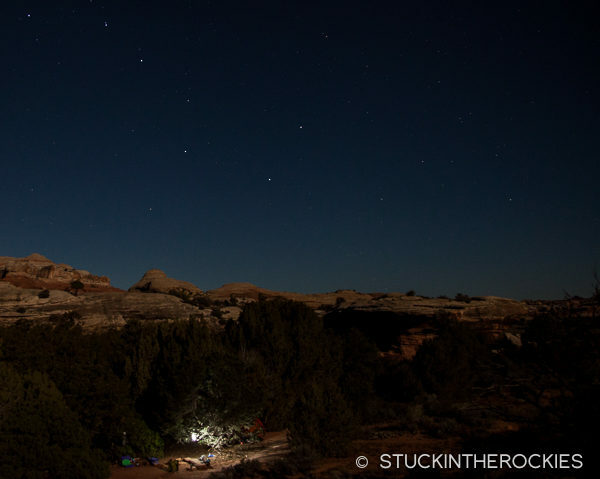 Our first camp (SC1) under the stars. The north-south canyon route can be completed in either direction. 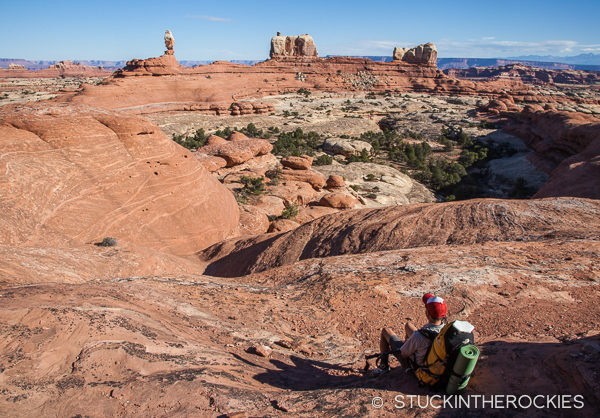 We chose to head north from Cathedral Butte to Peek-a-Boo Spring and then Squaw Flat, spreading out the distance over four days. 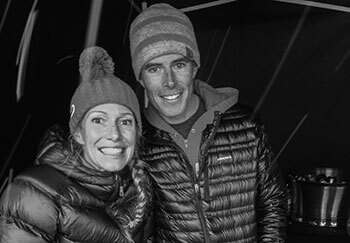 We had permits for two campsites, SC1 and SC4 and for the third night we were in the Salt/Horse Open Zone and were allowed to camp in place of our choosing. 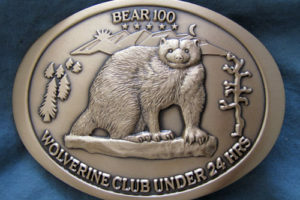 On the fourth day we made it to the Squaw Flat Trailhead where we had left a car. That allowed us to shuttle back down to Cathedral Butte and pickup the one we left at the start. This area is known as the Big Ruin and was really impressive in scale. You can see the shelters tucked in the cliff, lots of them. 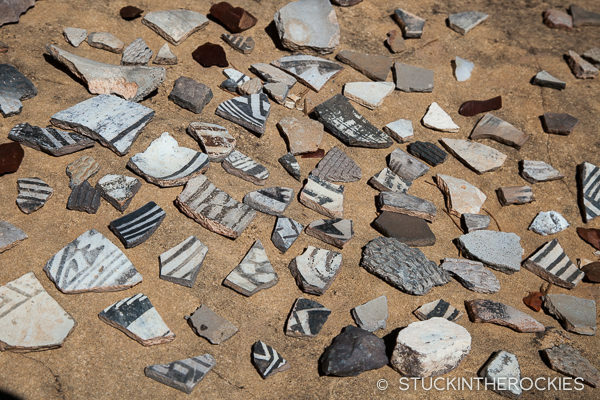 There were pottery shards everywhere. 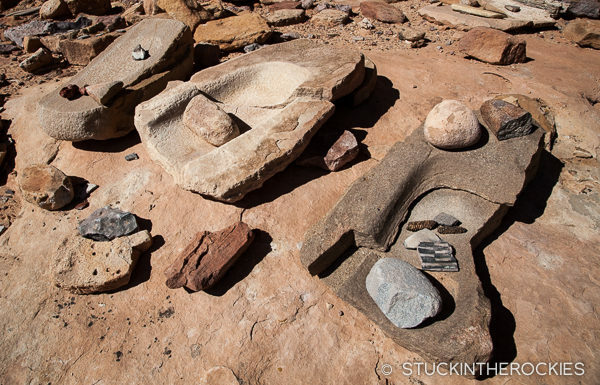 We often found them arranged on rocks, which is a practice that is frowned upon by people who manage these ruins. While I understand why they ask people not disturb these artifacts, I wonder if leaving them lying in the dirt and potentially getting stepped on, washed away, or otherwise damaged is a better option. I don’t really fault people for trying to organize them like they do here. Grinding stones, old corn cobs, it’s all right there. The ruins and petroglyphs were impressive. 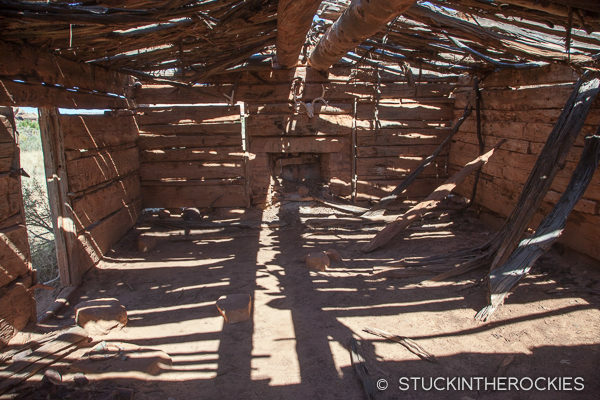 It wasn’t long after starting that we encountered mud and mortar constructed shelters, old granaries, and even grinding stones with old dried corn cobs laying around. 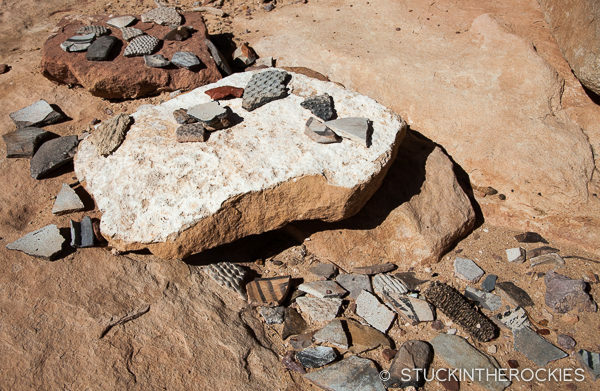 In many places, when we looked closely, we found loose jasper and pieces of arrowheads, as well as shards of broken pottery (known as potsherds) scattered on the ground. 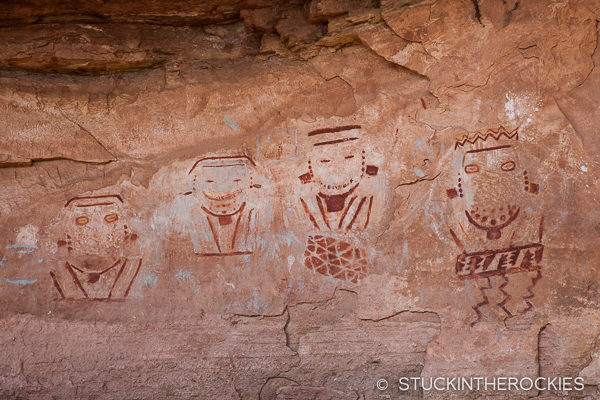 Petroglyphs often decorated the walls above, including well known examples such as the Four Faces and All American Man. 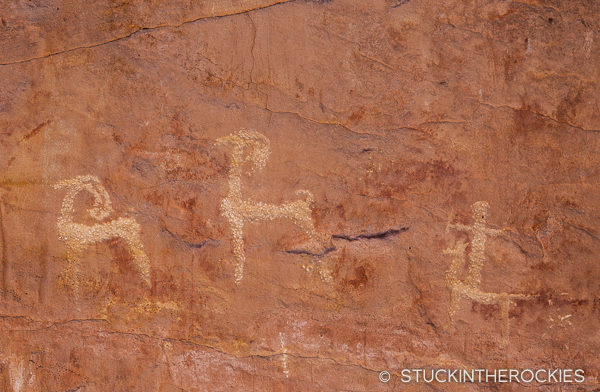 The “Four Faces” petroglyph panel. “All American Man” is the most well-known from this area and was unlike any petroglyph I had seen before. The second day, between campsite SC1 and SC4 had the most ruins to see. 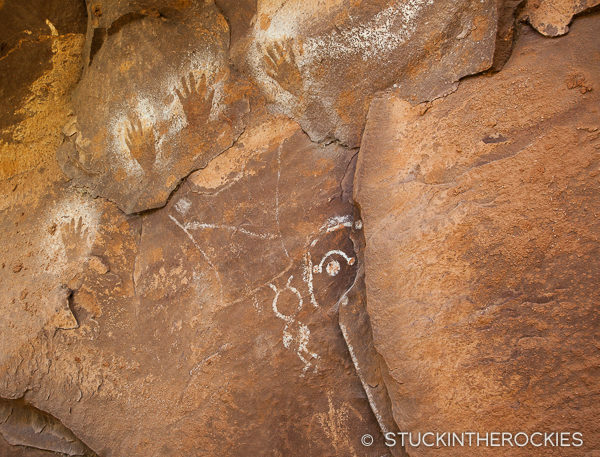 We were told that these images were likely made by vandals who chipped the images in the rock. 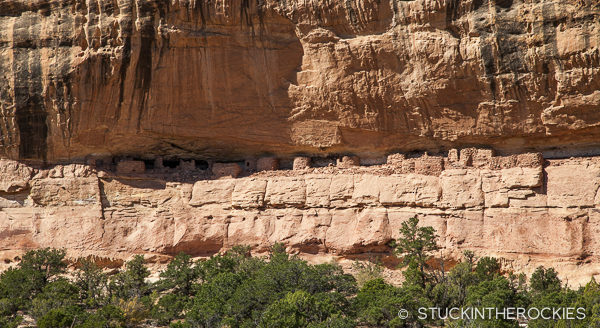 Horses weren’t introduced until 1540 and the early Fremont and Anasazi inhabitants that resided here hundreds of years earlier and had no known history with the animals. 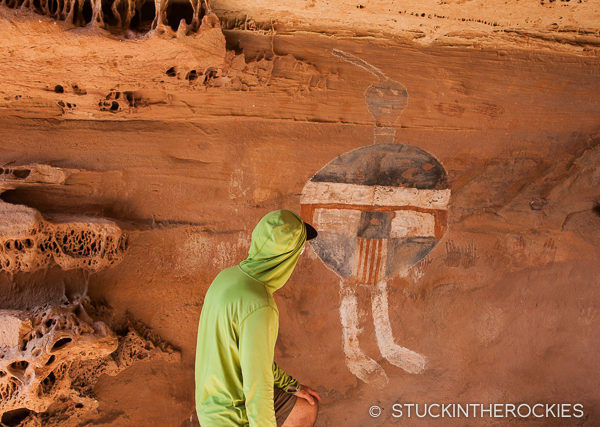 If true it’s too bad some people would feel alright doing this alongside authentic petroglyphs. It’s really something to be near these ruins and ponder the life of the original inhabits a thousand years ago. It’s hard to imagine what it must life must’ve been like for those early people. Certainly different than it was for us, with our super light backpacking gear, cook stoves, freeze dried meals and satellite communication. 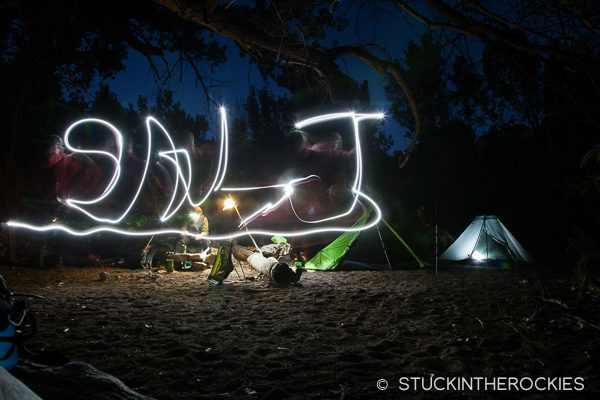 I think that’s what made Salt Creek so interesting for me. Sunset on the second night by SC4. Campfires aren’t allowed in this section of the park unfortunately. We were still able to entertain ourselves though. 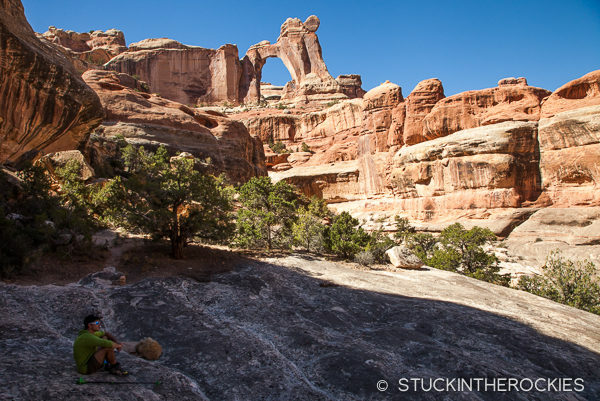 A side hike took us to Angel Arch, which is well worth the trip. One more panel by Peek-a-Boo Spring. Evening on the third day, looking north to the La Sals. 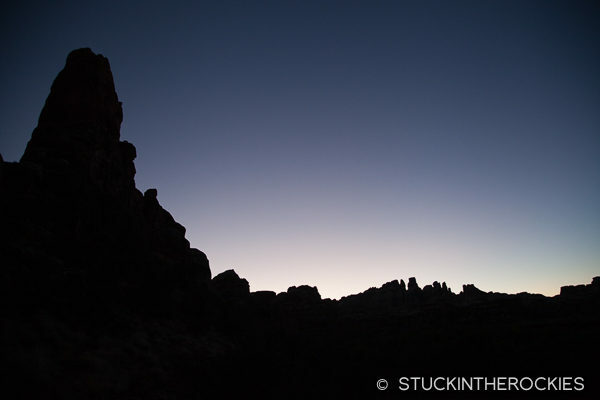 On the fourth day we hiked out to Squaw Flat and wrapped it up. Hey Ted,really enjoyed reading about your newest adventure.Looks like a pattern of getting to desert terrain in the fall huh. (nice change of pace).It would be nice to go there,doubt they want my dogs trampling all over the pottery though,my furry kids can be a pain sometimes planning trips,might have to boot them out when they get older,^^.Take care. Hey Randy, I think it’s partly the fact that it’s warm and sunny there and it’s getting snowy and cold back home. It takes a while for the season switch-over to conclude. You know there are some cool spots out in that area that are OK for dogs, it’s just teh national parks that sometimes frown up them. 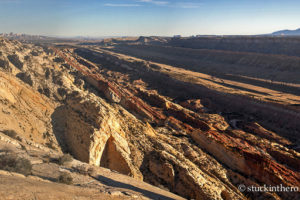 How was the drive out to cathedral butte to start your hike? Thanks. The drive is kind of long, more than an hour if I recall. And we had to do it twice, botb before and after the trip to get the trucks when were were finished. As far as the road conditions go, it was a in pretty good shape. 2wd is fine.